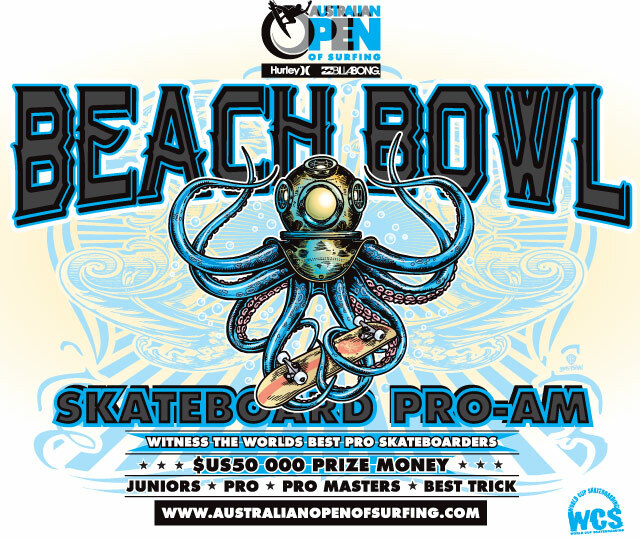 HURLEY and BILLABONG are sponsoring the Australian Open of Surfing which is having a skate bowl riding comp on February 16th to 19th as part of the festivities. The Beach Bowl Comp will have Pedro Barros, Renton Millar, Grant Taylor, Rune Glifberg, Curren Caples, Jack Fardell, Bucky Lasek and Bob Burnquest, among others, in attendance. The prize purse for the contest is $50,000 USD. This event will be held in the wooden Soul Bowl that was used in Huntington Beach and Hermosa Beach for a very long time. The Soul Bowl was replaced with Coastal Carnage when Converse took over a couple of year ago. 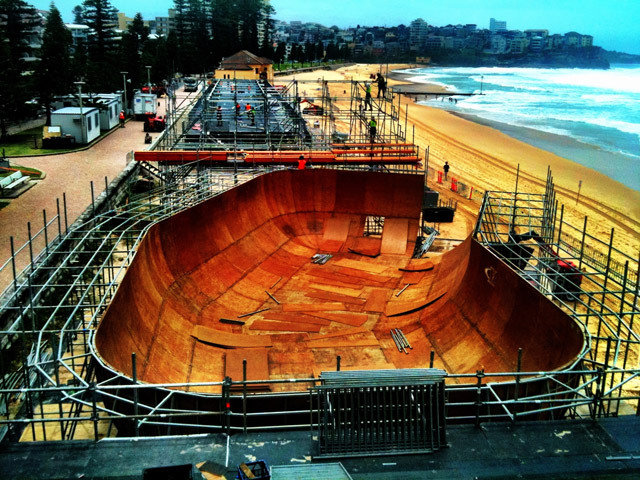 The event will take place at the Beach Bowl in Manly Beach, Sydney. This photo on the left, was taken from the towering top level of the grandstand with four days until completion, looks north across the Beach Bowl, the bones of the VIP area, the competitor’s area and to the North Steyne Surf Club. Behind and to the south is where the Channel [V] music stage will be located. The bowl is part of a bigger, surfing, event being held in Manly over the next couple of weeks that includes guys from surfing's World Tour. Frankly, the bowl is looking awesome! Manly is another of Sydney's magical beaches.... Nearly as famous as Bondi. It's a much longer beach though and, like Bondi, is very popular with the surfers and backpackers. The place is wired this time of year and the crowd around that bowl will make Newcastle look very tame indeed. There will be a Pro Events and a Masters’ event as well as Juniors, and Best Trick event. February 16th, Thursday: Am, Pro and masters. Practice. Under 18 contest. There is a $50 AUD entry fee. Coverage: Nigel Dawes in Sydney and Xavier Lannes in Los Angeles.